In Part 1 of this article, we looked at how using leverage to trade shares works when drawing on the equity in your home. In Part 2 of this article, we will look at how you can use a margin loan to invest in the share market if you don’t have a property to use as collateral. We will also discuss how secure leveraging is, as well as the Rule of 72, which is a concept that helps you to understand the compounding affects on your investments. Before we get into this article, we want to remind you that just as leveraging can increase your gains, it can also magnify your losses. It is for this reason why it is important to always manage your risk and protect your portfolio from any downside risk because trading the stock market is not about how you can make, it is about how much you do not lose over time that makes you wealthy. So far we have concentrated on borrowing against the equity in your home to leverage investment opportunities. But you can also take advantage of another method referred to as margin lending. A margin loan is similar to a line of credit but instead of using a property as security, this type of loan requires you to put up cash or shares as security (collateral) to get access to more capital. And just as you do with borrowing against property, you will pay interest on the margin loan, which is typically set at a slightly higher rate than a Line of credit. This is because it is generally accepted that the risk you are taking is higher than with a line of credit. Generally, lenders will loan you up to 70 per cent of the total value of the portfolio. Therefore, if you have $30,000 in cash or securities, you can leverage up to $100,000; in other words, the lender will finance you an additional $70,000 so your total exposure to the share market is $100,000. The total share portfolio then acts as security on the loan. And once again the interest on the loan is tax deductible because you are using it for investment purposes. So let’s take a look at how it works. If the market rises by 10 per cent, you will make a capital gain of $10,000 on the $100,000 invested rather than a gain of $3,000 had you only invested your own money. If the value your portfolio falls in value, however, the lender may make what is called a margin call. This is simply a request from the lender for you to add additional capital to reduce the loan so the percentage of the total value of the portfolio made up of loan funds always remains at 70 per cent. In my experience, however, this is rare if you invest in solid blue chip stocks. To minimise your risk of this occurring, it is advisable that you avoid using all of the available funds that the lender provides. Allow yourself a safety margin in case something does go wrong. For example, if you have access to an additional $70,000, you may only want to consider using 70 per cent or $50,000 of the available funds, so that you only have $80,000 exposed to the market and retain $20,000 for any potential margin calls. That said, when using leverage to trade shares through a margin loan, I have a simple rule to not borrow more than the value of the collateral you put up for the loan. For example, if you have $1.00 in cash or shares, you should only borrow $1.00, so that you have a loan to value ratio (LVR) of 50/50. That way you do not over expose yourself too much leveraging. Now let's consider the impact on your capital when you invest in shares using the cash from the equity in your home as opposed to borrowing other people's money. 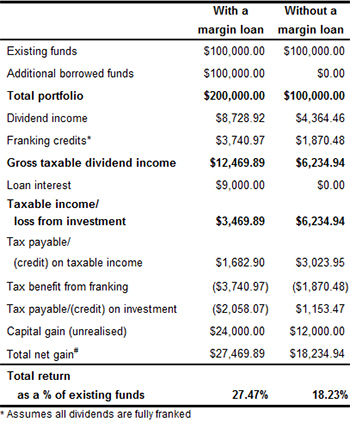 With a line of credit, if you draw down $40,000 on the loan to invest, and it falls by 10 per cent, then on paper you have lost 10 per cent of your capital or $4,000 (excluding any dividend income you may have received), plus the interest paid on the borrowings. But what if you invest $40,000 in cash and decide to take out a margin loan to leverage your investment (assuming an LVR of 50/50), in this instance, you will have $80,000 invested in the market, which is great if your portfolio increases in value by 10 percent. But if it falls by 10 percent, your loss would be $8,000 (before any interest payments or dividend income) or 20 percent of your equity. This example illustrates how losses will be magnified when using leverage, which is why we highly recommend you get the right knowledge and skill when it comes to trading the stock market before you use margin lending. Once you understand the risks involved and you have the knowledge to implement a successful investment strategy, you will be able to safely use leveraging to trade shares with confidence. Now let’s look at an example of how using other people’s money can compound your returns. Let’s assume you have $100,000 in cash and you decide you want to take advantage of the benefits that leveraging offers and you borrow an additional $100,000 so that you have $200,000 exposed to the market. The interest rate on the loan is 9 percent and you are currently in the top marginal tax rate of 48.5 per cent, the annual return is 12 percent and the average dividend yield is around 4.3 percent. What do you think the outcome would be if you used other people’s money to leverage your investments? As you can see in Figure 1, below, the results are pretty impressive, don’t you think? What is even more impressive is that your investment is positively geared from day one so that the income from dividends and franking credits more than covers the cost of your loan repayments, despite having used an interest rate of 9 per cent (at the time of writing, margin lending interest rates were around 7 percent per annum). Can you see how this strategy can fast track your financial goals, enabling you to create a very sustainable income in retirement? Remember, however, you must prove to yourself first that you can be profitable in the share market before you consider leveraging as an investment strategy. If you understand the rule of 72, you can compound the success of your investments. Quite simply, if you divide a particular annual return into 72 you will be able to determine how long it will take to double your money. For example, at 7 percent growth a year, an investment will double in value in a little over ten years. At 14 percent growth, an investment will double in a little over five years. If in the fifth year you own a total of $200,000 in shares that is returning 4 percent in dividend income, you will be receiving $8,000 in income. Taking into account the tax rebate you receive on the borrowings, your income would be more than paying for the interest on the loan as shown in Figure 2, below. So how secure is leveraging? An obvious question that most people ask is: how secure is leveraging? If you invest wisely in blue chip shares, the value of your capital should grow as the shares increase in price. Because the assets securing the debt are growing, your overall financial position is also increasing. This provides peace of mind because if you run into financial difficulties, you can always sell you’re assets and pay back the borrowed funds. You will have to pay capital gains tax when you dispose of the assets but you will only pay tax on the gain itself, not the money you borrowed to invest. Obviously, the amount of tax you pay will vary depending on your marginal tax rate and how long you have held the asset. Depending on the interest rate and your income from dividends, you can usually achieve a neutrally or positively geared investment within a very short period of time. For example, if you borrowed $50,000 to invest at a rate of 7 percent and you received on average 4 percent from dividends, it would take you a little over three years to become neutrally geared assuming you receive an annual return of 10 per cent on your investment. Of course, if interest rates or dividend yields change, this will alter the time it takes. The most important point to remember, however, is that as long as the difference between what you own (assets) and what you owe (loans) is increasing you are minimizing your exposure to risk. But I must stress again, it is not until you acquire the relevant knowledge and understanding on how to invest profitably in the share market should you consider using leverage as part of your wealth creation strategy. If you are new to the share market and you want to learn how to get started, I encourage to read my article on the ABC of share trading. If you are serious about trading, I encourage you to purchase my latest award winning book Accelerate Your Wealth, It's Your Money, Your Choice, which provides you with a proven, low risk approach to investing directly in the stock market. We also deliver trading courses that enable you to become consistently profitable regardless of whether you decide to use leveraging. But don't take our word for it. Hear what our clients have to say by viewing their reviews and testimonials.